I have been playing “newsletter hooky”. After 6 years of writing a newsletter every 6 weeks (38 Newsletters) I took the summer solstice and the summer-fall cross quarter newsletter off. It was liberating and fun for me to “break” my own self imposed rule of 8 newsletters a year. I was on vacation over the summer solstice and gently watched as I didn’t sit down in the weeks and days prior to write the newsletter. It felt “in alignment” not to write it. We can fall into habits which become obligations, leaving us feeling burdened and confined. If we keep doing it we martyr our energy. We have choice to shake it up. Start small; a missing newsletter or two requires little “clean up”. My commitment to myself and you is to write something that inspires me; if I’m not inspired it’s pointless busy work. What’s on your to do list that you can joyfully cross off with out doing it? Use this “mini rebellion” as an affirmation: “I can switch it up whenever I want”. This is a reminder to “do” life because you love it, because it’s fun, inspiring and creative. Simply because you want to. The coolest part is while I wasn’t writing newsletters I was having one of the most playful, adventurous summers I’ve had in a long long time. 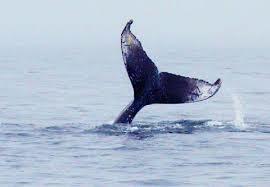 and being enchanted by my own private whale tail show… tail slapping joy right here in Capitola. Yay for the joys of summer!